Are there any side effects related to drinking alkaline water? Is there anyone who should not drink alkaline ionized water? How long does alkaline water stay ionized? Is alkaline ionized water good for athletes? When you start drinking alkaline water, normal side effects may include headaches, fatigue, muscle aches, a runny nose, and other flu-like symptoms. Also, your stool will likely be darker, softer, or more odorous and you may experience gas. These side-effects are a good sign, as they are directly related to the detoxification that your body is undergoing as the micro-clustered water penetrates deep into your tissues and expels acid waste and toxins that have accumulated in your body over time. Side-effects will subside once your body has become accustomed to the water, anywhere from 2-3 days to 2-3 weeks, depending on each individual and the level of detoxification that the body needs to undergo. No. Do not drink ionized water 30 minutes before and up to 1.5 - 2 hours after meals. Our stomach needs to be acidic to digest the food we eat, and drinking alkaline water with meals will simply slow down the digestion process. No. Do not drink ionized water 30 minutes before and up to 2 hours after taking medication. The smaller cluster size of the ionized water makes the water penetrate the cells in our body much more quickly, and it is best not to interfere with the prescribed absorption rate of the medication. 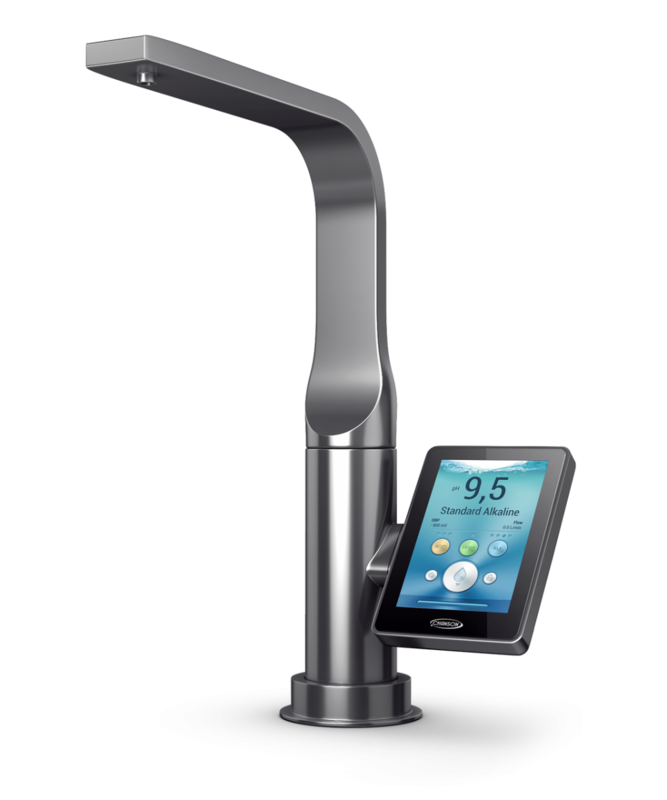 You can, however, drink the pure filtered water (pH 7) from the ionizer with your medication. Have your first glass of the day right when you get out of bed. 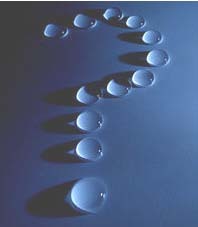 The water absorbs best into the system when your stomach is empty. Then you should continue to drink alkaline water throughout the day. Remember not to drink ionized water 30 minutes before and up to 2 hours after meals and medication. Some people must start by drinking very small amounts of alkaline water, such as 1-2 glasses of Level 1 (8.5 pH) per day. This is especially true of older people who often have accumulated toxins in their bodies over the course of their lifetime. 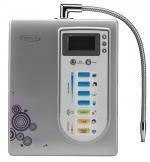 Children under the age of 3 should not drink alkaline water, but only purified water from the ionizer (pH 7). Thus, they will benefit from the ionizer’s filtration that removes chlorine and other contaminants from tap water. Children between the ages of 4 years and 12 years should only drink alkaline water at Level 1 (one) or Level 2 (two). Yes. Water that enters the ionizers first goes through a filter that removes the taste and odour of chlorine contained in municipal tap water. Then electrolysis breaks down the size of the water clusters, from 12-16 molecules to micro-clusters of 5-8 molecules. This makes the water taste smoother and silkier. Alkaline water tastes great, and makes better tasting coffee, tea and juice. It is also wonderful to cook with because it helps hydrate the food and bring out its flavour. All consumer sized water ionizers are designed for immediate "point of use" consumption. The water molecules that have been separated and rendered instable through electrolysis will slowly come back into a stable state. This is the reason that ionized water cannot be bottled as its properties are temporary. The antioxidant properties (hydroxyl ions) of alkaline ionized water will dissipate in 18-24 hours, the higher pH properties will come back to a neutral pH level of 7 within 1-2 weeks, and the smaller molecule cluster size will last approximately 1-3 months. It is best to drink alkaline water straight from the ionizer, but failing that, store the water in a glass container in a dark, cool place, such as the refrigerator. Absolutely! Proper hydration sustains the body's physiological responses in all activities, but the physical and mental stresses of athletic training and competition magnify the importance of hydration. Numerous studies conducted on athletes since the 1940s have demonstrated that even mild dehydration impairs performance. Alkaline ionized water is micro-clustered, so it can be absorbed at a faster rate, helping with rehydration of the body’s tissues. Furthermore, blood oxygen levels increase with regular use of alkaline water. providing the muscles tissue and organs with high amounts of oxygen and improving stamina and endurance. Water that has been alkalized also helps to neutralize the exercise induced lactic acid build up in the muscles, and improves recovery time. No. Some people have been known to drink 4 or more litres of alkaline ionized water every day and gotten great benefit from it. On the contrary, one of the most common imbalances people have today that leads to health problems is that they are too acidic. The more acidic we are, the greater the chances of illness taking hold in our body. In fact, it is rare for a person to acquire alkalosis, the condition of being too alkaline. To maintain optimal health we should maintain a balanced pH diet that includes alkaline water and alkaline foods such as fruits and vegetables. Several external signs can show that one's body is too acidic. Some examples include an unexplained rash, acne, dark circles under the eyes, cracked skin and nails, brittle hair, and excess weight. Other signs include stomach upset and indigestion, confusion, anger, or irritability, food sensitivity and allergic reactions, recurrent infections, fatigue, and even depression. When one improves the body’s pH balance through an alkaline diet, including plentiful fresh, raw alkaline foods and alkaline water, the body’s natural defence mechanisms are able to function properly and fight off illness and disease and naturally restore optimal health conditions.